To me, John Fogerty is the ultimate rock ’n’ roller. His songwriting—as evidenced by a myriad of deathless Creedence Clearwater Revival hits and some stunning solo tunes—is untouchable. He’s one hell of a swamp-rock lead guitarist. And when it comes to singing, man—what a voice! He just brings it all together, and whether you’re eight or 80, tunes like “Bad Moon Rising” and “Up Around the Bend” have been scientifically proven to get your blood running faster. 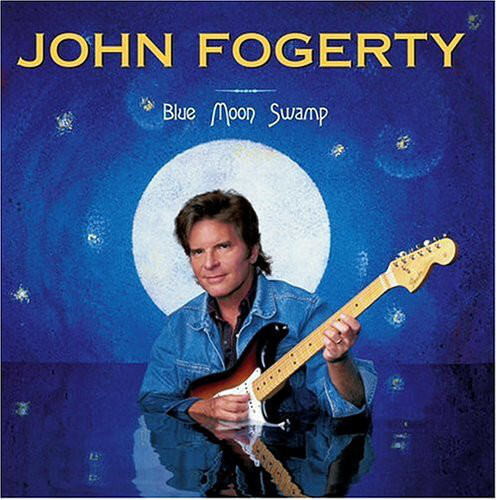 The last time Fogerty brought all his talents clearly into focus was on his solo Centerfield album of ’85, arguably that decade’s finest roots-rock recording. Recalling how consistent that disc was—with nary a second of filler among its 35 minutes—I had extremely high hopes for Fogerty’s first release in 10 years. But as effective as Blue Moon Swamp is in spots—one example being the powerful first single, “Walking in a Hurricane”—it’s no real match for Centerfield. Fogerty sings well enough on his new album—and deftly handles guitar, Dobro, lap steel, electric sitar, and mandolin—but on tracks like “Hot Rod Heart” and “Rambunctious Boy” his good-old-boy persona seems a tad contrived, as though he’s unconsciously been picking up redneck clichés from the plethora of cowboy-hatted “new country” artists out there. Compared to a lyrically rich tune like Centerfield’s “I Saw It on T.V.”—which brilliantly captured the spirit of the North American ’60s experience in four minutes—Fogerty’s current infatuation with cruisin’ and chicks doesn’t quite ring true. Still, if a rockin’ beat and party-down vibe are what you’re after, those tunes—with thanks to the precision drumming of session great Kenny Aronoff—will do the trick. I just expect more from the guy who gave the world “Fortunate Son”.